Classy and Classic. 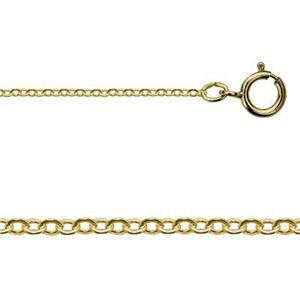 A 16 inch finished 14/20 yellow gold filled 1.2mm flat cable chain. No wonder it’s one of our top sellers. It can be yours, too! We also sell the same style Sterling Silver 1.2mm Cable Chain Necklace as item 20830F16. This is a dainty chain, but sturdy. It's substantial enough to use with three charms.I'm very happy with it.